Elfried Hoeber, Johannes Hoeber and their son Tommy admire the $1,000 check from the Philadelphia Record, April 1943. My parents, Johannes and Elfriede Hoeber, got out of Nazi Germany in 1939, just before the start of World War II. They brought with them intelligence and a good education and very little else. My father wrote well and his English was excellent, and in June 1940 he landed a job as Director of Public Relations for the Philadelphia Housing Authority. This meant writing press releases and informational brochures about public housing. War industries were attracting thousands of workers to Philadelphia, creating a housing shortage, and the Housing Authority was building projects furiously to meet the demand. It was my father’s job to keep the public informed about what the Authority was doing. Unfortunately, the Housing Authority was a political entity and one day in October 1942 there was a sudden shift in the political alignment of the Authority’s appointed members. Without warning, my father was out of a job. The timing was lousy. America had been involved in the war for almost a year. My sister was 12, my brother was just a year and a half old and I was about to be born. For our family to be without an income was a disaster. My father would be out of work for the next six months. Luckily my parents had already made wonderful American friends shortly after their arrival in this country. A comparatively well-off couple, Walter and Mary, learned that my father was unemployed and without even being asked sent my parents a check for enough to live on for quite a long time. It was a wonderful act of generosity, but my parents were anxious not to impose on their dear friends. A few months later, while my father was still unemployed, the Philadelphia Record, the city’s second largest newspaper, began running a puzzle contest with large cash prizes. The contest required contestants to identify pictures of more than a hundred leaders around the world connected with the war. It wasn’t terribly difficult, and many readers identified all of the images. The paper then launched a further tie-breaking contest that called on finalists to write an essay on “the most important name in the war.” My father’s essay was one of two winners, and he received the unimaginable sum of $1,000, the equivalent of nearly half a year’s pay for him. Shortly thereafter, my father landed a new job and was able to use the contest winnings to repay Walter and Mary’s unsolicited loan. Not incidentally, when I was born my parents gave me Walter as a middle name. and gave millions in his own country, millions in all parts of the globe new hope for freedom of speech, freedom of religion, freedom from fear and freedom from want. 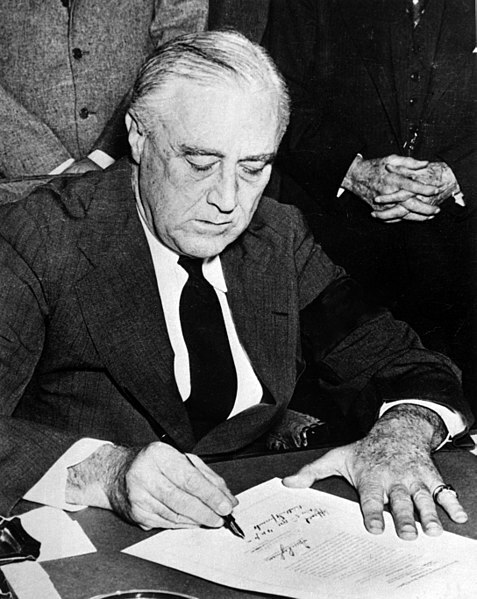 His name is Franklin Delano Roosevelt, the most important name in this war.